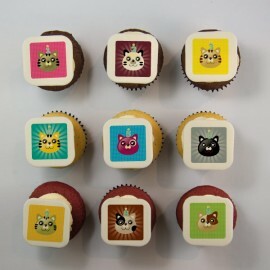 > Cupcakes>Occasions>OTHER OCCASIONS : Anniversaries, thank you, congratulations, get well, graduations, etc. Whether it is for a birthday, an anniversary, a thank you, congratulations, a get well, message, a graduation, we have the cupcakes you need! Delivery available in the Greater Montreal Area (Laval, north shore, south shore). OTHER OCCASIONS : Anniversaries, thank you, congratulations, get well, graduations, etc. There are 7 products. To celebrate a birthday or an anniversary as it should be, our pure butter cupcakes decorated with gifts, fireworks, balloons, cakes or even birds, owls or cats made of marshmallow fondant will put your guests in the mood for fun! You wish to show your gratitude or to thank someone for a particular reason? Our pure butter cupcakes decorated with “thank you” illustrations made of marshmallow fondant are perfect for every occasion and will please for sure! (available also with English writing). Please specify which model of decoration you want. You wish to congratulate someone for a specific occasion? 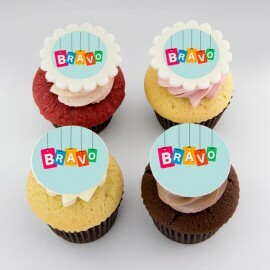 Our pure butter cupcakes topped with “congratulations” or “bravo” illustrations will be greatly appreciated! You know someone who is on a convalescence and you wish to bring some happiness in his life? 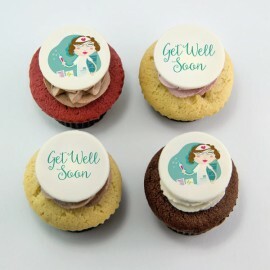 Our pure butter cupcakes topped with a funny nurse illustration on marshmallow fondant as well as a message “get well soon” will bring smile back for sure! You wish to sweeten your child or relative’s First Communion? Our pure butter cupcakes decorated with religious symbols made of marshmallow fondant will pass the test! 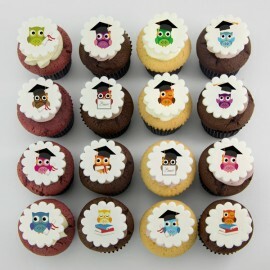 These Graduation cupcakes with graduated owl illustration on marshmallow fondant will bring fun and magic to your table.